My guest today, is a man I've only spoken to over the internet, via twitter and his blog. David Cranmer is the creator and editor, behind Beat to a Pulp. A webzine featuring hard boiled short stories in a variety of genres that pack a punch. I wanted to show another side of David not just the writer or the editor, but the man the one who refers to his small family as, the charmers. Without further ado, I give you David. This is my favorite picture of my mom and me. 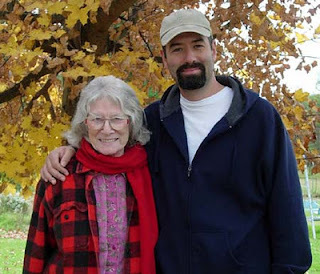 It was taken several years ago at the family homestead where she's lived for over forty years. She could be called a stay-at-home mom, but she was much more than that to me. She was someone who listened to my troubles, congratulated me on every miniscule accomplishment, and gave me a love for reading, movies, and music. I remember watching with her many golden oldie films like KEY LARGO and THE ADVENTURES OF ROBIN HOOD. She inadvertently taught me what makes a story tick every time she'd switch off the tube when a show was a waste of time. She handed me THE PRISONER OF ZENDA and Mark Twain books to read. From Sinatra to Springsteen, we would enjoy music together. What an influence! What credit I may receive for my humble writings, or even the BEAT to a PULP webzine, well, she gets a humongous slice of the credit. She was always in my corner cheering me on. The curtain to her final season is descending too quickly, and I intend to be there for her. I love you, Mom. Thanks. That's very touching, David. You are fortunate to have such a wonderful mother. What a wonderful tribute, David. Very Nice Dave. We must not forget the unconditional love that made us what we are today. Wonderful. What a grand tribute. A great tribute... she sounds like a great lady, and she raised a great son. Kent, Now I will add she can have her days. lol. Mates, She did good. And unconditional it is. Very kind words, Tom. Many thanks, amigo. She sounds like everything a parent should be. You have clearly done a wonderful job raising your son. I see good parenting and a passion for reading passing to the next generation too. Your granddaughter is adorable. Hello! You have a nice blog here. Thanks for posting this. I just wanted to say thank you to everyone who showed up to support David. When I asked him to do a guest post, I simply asked him to let us get to know him a bit better. And he gave us wonderful insight into the woman who helped shape him. You're a stand-up guy, Mr. Cranmer. Your mom obviously did right in the raising. And then some, Chris. Thank you, sir. Gracias, Randy. Thanks for stopping by. Sarah, She smiled and said thank you very much. Chudney, I really appreciate the opportunity to talk about my mom. It’s a post that wouldn’t have come to pass if you hadn’t asked. I’m grateful. Chris, Deeply appreciated, my friend. What a beautiful tribute to a mother. What a nice reminder of the subtle ways our mothers influence our thinking as we grow up. One of the truckloads of things mothers do that they never get credit for. Fine sentiments and well deserved. Thanks for the intro and the photo. Wish I could have known her as you have done. What a lovely tribute to your mom, David. All I can say is, she did a great job raising you! Clearly she knows what's important. Thanks, J.P. I appreciate you stopping by. Subtle it is, AC. And it took me many years to unearth that fact. Ron/Alyssa, Thank you, both. It's great to have such good friends in life. Today is our 8th anniversary! Dear old Bessy is no more. Music Monday! Delilah- Whataya Want From Me. Photo Friday! Day Date with the hubby.